Quite a while back, Malte Clasen, Joachim Kneis and I wrote a seminar paper on Arithmetic Coding. Apparently it’s not a bad paper, as it has been heavily cited. In particular, people appear to appreciate Malte’s C++ implementation of Arithmetic Coding, which fits on a couple of pages. 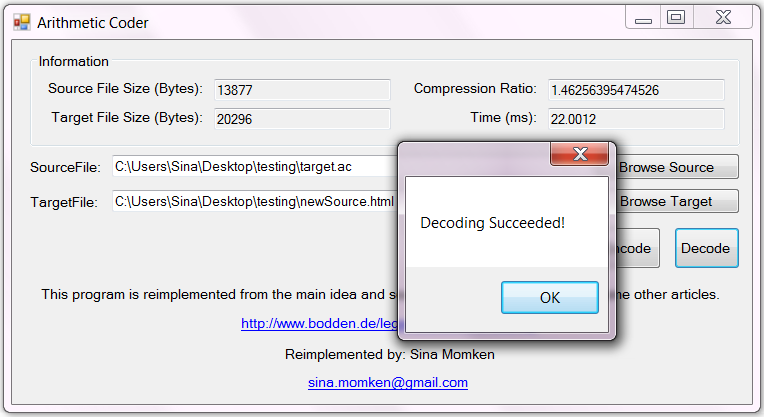 This week, Sina Momken emailed me a very nice re-implementation of the coder in C#. The implementation is available in source from our AC website. Thanks Sina!